In the pristine rainforests of Loreto department, and near to Iquitos City inhabit jungle tribes as Boras, Yaguas, Capanahuas, Huitotos and Cocamas, almost all incorporated to the civilization by evangelical missionaries, but they conserve much of their ancestral customs. Among others as Jíbaros (formerly terrible reducers of heads), the Remiyacus and the Mayorunas. 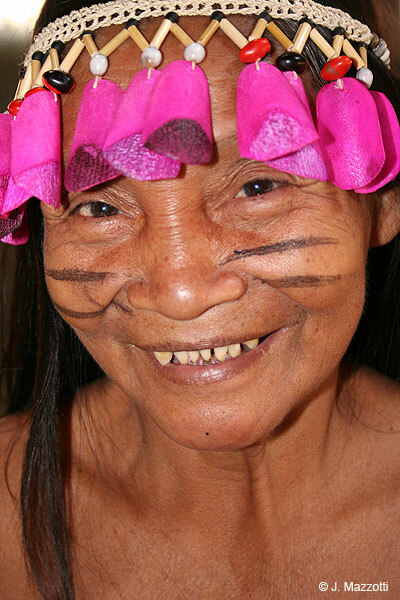 In the Peruvian Amazon basin are divided up into 15 linguistic families and 43 different languages. 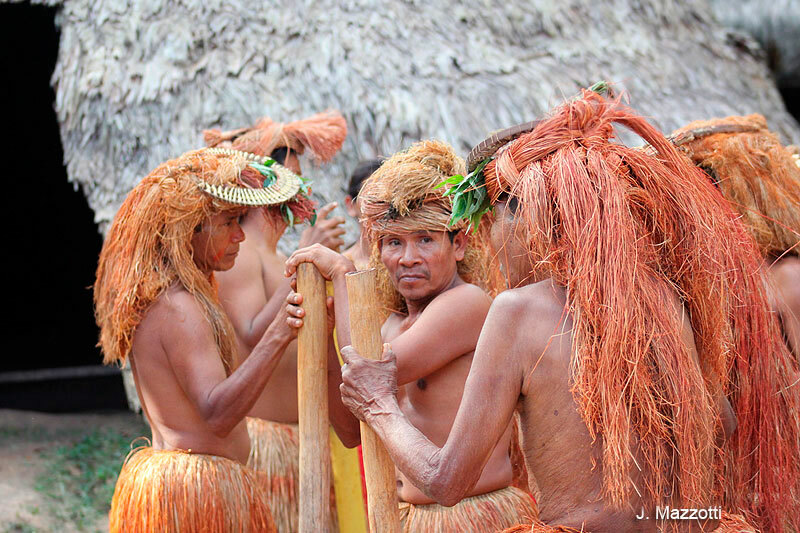 These natives are engaged in hunting, fishing, gathering and small-scale agriculture. Some native communities have incorporated the rural tourism, and handicrafts, and encouraging its inclusion and participation in the globalization process, rendering tourism a complementary source of income, as well as a conservation tool for its history and environment. This native communities have many myths and legends, some of them mystical; there is a great diffusion of the folkloric and quack medicine on the base of the great quantity of medicinal plants that exist. You can participate in Ayahuasca medicinal ritual. Near to Santo Tomás village, the area is inhabited by a Cocama Cocamilla indigenous farming community whose main economic activities are fishing and ceramic making. Some Amazon Lodges in Iquitos incorporated these natives as workers and their tour programs include visiting to their communities where you can appreciate and purchase their crafts or enjoying a performance of music and dance. Today, 30 Quechuan speaking farming communities are spread throughout the Manu National Park as well as numerous Amazonian native peoples such as the Matsiguenka, Amahuaca, Yaminahua, Piro, Amarakaeri, Huashipaire and Nahua. Tambopata National Reserve is the home of the E'se Eja, an ethnic group that has lived in the area since ancient times and knows every inch of the reserve. The E'se Eja are currently organized in three communities: Palma Real, Sonene and Infierno. The latter community works together with private companies to offer diverse activities and tourism services including lodging and guided tours, among others. The project has been considered a global success, thanks to the cooperation between the community and a private company to offer a beneficial eco-tourism product. Local inhabitants come from the Alto Putumayo area, on the border with Colombia. They migrated to where they live now, attracted by the rubber trade. Cultural customs and traditions are still upheld in the area. Local festivals and ceremonies are associated with myths and legends. Body paint is used during the dances, with the stylized serpent being the image of choice for both men and women. The "Pijuayo Festival" and the "Danza de la Viga" are the most important, where masks representing mythical beings are used in depictions of mythological episodes representing the origin of the world, man and the Bora culture. Local handicraft items can be bought. Location: From Iquitos City go to Bellavista Nanay port and depart by speedboat, on the Nanay - Momón rivers (20 minutes). On the banks of the Momón river. Began after years of work among different conservation entities and three communities of colonists (Yarina, Veinte de Enero, and Manco Cápac) who settled in the Yanayacu - Pucate river basin. It is an ideal product for birdwatchers, researchers, photographers, and nature lovers. For a week, the traveler coming to Pacaya - Samiria’s awe-inspiring aquatic world will be able to observe unique plant and animal species, not to mention landscapes that are seen no where else in the Amazon. Here, the villagers themselves provide tour guide, information, accommodations, and food services and are very committed to their natural resources and seriously determined to enhance their lives through the use of such resources following the standards of ecotourism. The Pacaya Samiria National Reserve is located in one of the biggest depressions of the Amazon, a reason why it is formed basically by swamps and floodable forests that host a varied flora and fauna: 449 species of bird, 102 mammals (including the pink dolphin), 69 reptiles, 58 amphibians, 256 types of fish and 1,024 cultivated and wild plant species. Also protected here are threatened and endangered species, like the black caiman, the manatee, the Giant South American turtle, the Peruvian spider monkey, the river otter, and the elusive pink dolphin that lives in the cochas (lagoons) of the reserve. In the Yanayacu - Pucate river basin, activities that promote sustainable resource use are part of the daily lives of the local population, and they are visibly successful, with such shining examples as the huasai palm tree reforestation project for the production of palmito (palm hearts) and non-felling harvesting techniques of aguaje palm tree fruits. When it comes to wildlife management, important species are taken under consideration, like the yellow-spotted Amazon River turtle and its renesting project, the ornamental fish, arawana, and the paiche (Arapaima gigas), the largest fish in the Amazon. Visitors can take part in management activities with the local inhabitants. A trip to the origins of the Yanayacu River, a black water river, consequence of the high concentration of vegetables substances in dissolution in the water, will allow travelers to grasp the enormous biodiversity of the reserve. On its banks abound jacanas, herons, neotropic cormorants, and a large variety of parrots. In its middle section you will find the community of Yarina, which is placed in a zone of high biodiversity, where more than 250 different bird species have been reported and includes a completely uninhabited, rigorously protected area. The great variety of wildlife in the sector features marvels, like pink dolphins, macaws, and primates of different species. The river begins at Lake El Dorado, an impressive body of water almost 500 ha, where the community dwellers of Manco Capac have managed to repopulate the paiche and the arawana for their sustainable use. This community-owned and operated company, is the result of a socioeconomic development project aimed to promote the sustainable use of biodiversity in fragile ecosystems. The people have proposed earning income through ecotourism and being continuously trained, as well as sharing the administration of the business.